It’s time D-Heads! This week, music plays a huge role as we welcome famed composer BRUCE BROUGHTON! 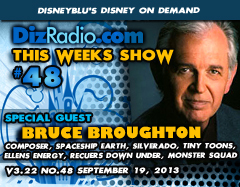 Bruce has composed a wide range of movies, tv, and theme park attractons such as Silverado, Rescuers Down Under, Spaceship Earth, Ellen’s Energy Adventure, Monster Squad, Tiny Toons, Dinosaurs, Harry and the Hendersons, O Canada, It’s Tough to be a Bug and more! Bruce is going to stop in and talk about his career, films, compositions, attractions and more from his award winning career. In addition we have the D-Team back as Lexie takes you down the Hollywood Walk of Fame with more on our guest Bruce Broughton. Paige returns with the Magical Music Review, and Jason comes at you with The Vault adding more DVD and Blu-Rays to your collection. 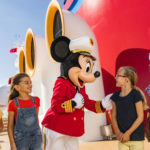 And it doesn’t end there, Randy is back with Disney Multi-Media and Interactive News. And Erin dips into the Virtual Mailbag answering more questions in I Want To Know. 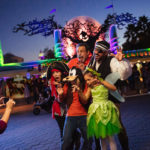 There is a ton of news hot off the D-Wire, and all kinds of magic and fun as we preview our upcoming Annual Not-So-Scary Halloween Celebration.